Let’s just go back in time again, to 1995, to my first ever trip to Strasbourg. More on that later. 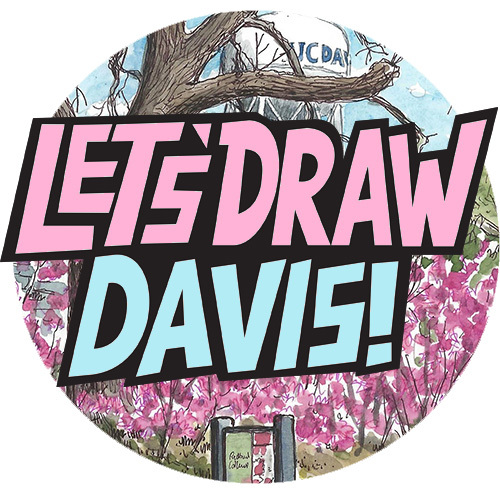 But let’s just say I ask my 19 year old self, in twenty years time, do you expect that you will come back to this city, right, and draw pictures of fire hydrants? I would have laughed the very crazy idea right back to England. 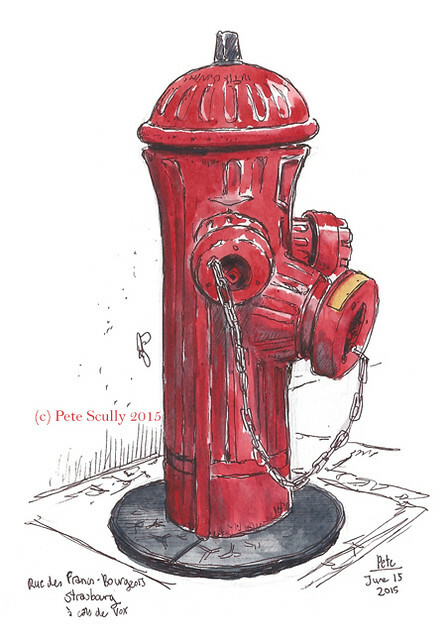 Yet here I was, in 2015, sitting crouched up next to red fire hydrants drawing them as if it’s totally normal. Actually if I’m honest, my 19 year old self would have been, “oh wow, respect.” My 19 year old self would have thought that was the coolest thing. My 19 year old self, may I remind you, thought that going to Denmark for the summer with less than a hundred quid in his pocket to pick strawberries and have adventures (adventures that largely consisted of being poor and getting sick of strawberries, it has to be said) was cool. My 19 year old self worked at an Asda coffee shop and would get red Slush Puppy all over my shirt and think, oh that’s cool, I look like Mr Blond from Reservoir Dogs now. My 19 year old self wore black adidas shorts and a nike baseball cap and a messy purple shirt that had buttons missing. My 19 year old self was frankly an idiot, but then that’s true of most stages in my life to varying degrees. Being 19 was a time I remember with great fondness, a time of energy and invention and wanderlust. 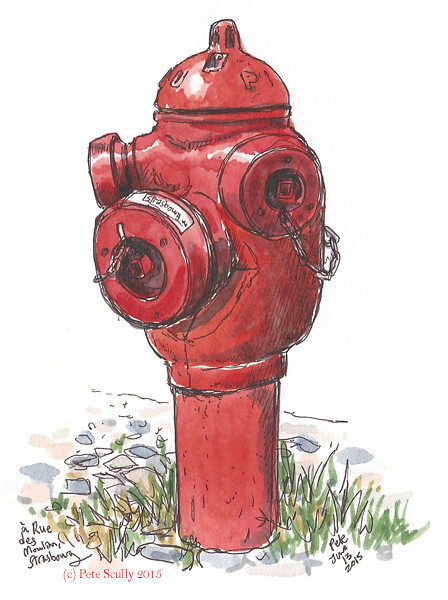 But I still wouldn’t have thought of drawing fire hydrants all over the world, that was not an idea that I had yet had. 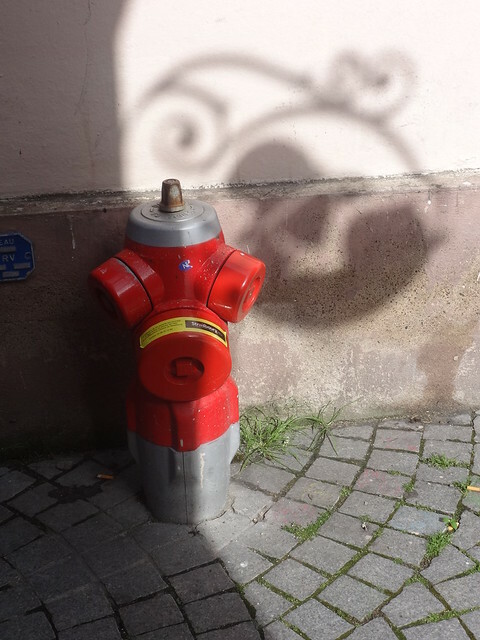 So I was pleased, on making this anniversary return to Strasbourg, to find they did have hydrants there too. I only drew the two above. The first one was sketched in Petite France, on the rue des Moulins. The second one was drawn on my last day in the city, on the rue des Francs-Bourgeois, across the street from the Vox cinema. Now, my 19 year old self went to that cinema. My 19 year old self had as one of his favourite movies (and it still is) Les Visiteurs, the French comedy classic about two knights who go into the present day, wash in the toilet, beat up a postal van, and so on. Jean Reno and Cristian Clavier, “Cousin Hubert”, all of that. Well, I didn’t see that there. I did see another movie with cristian Clavier there called Les Anges Gardiens, a stupid comedy he starred in alongside Gerard Depardieu (I know right, a French film from the 90s with Depardieu in it, such a rarity). I saw it on my second trip to Strasbourg as a 19 year old, a solo trip in the autumn of that year, when I came back to explore the city more by myself. I recall it was billed as being the ‘next Les Visiteurs’ so I had to see it. It wasn’t, it was bloody awful. You see? My 19 year old self was an idiot, even my 19 year old self knew it. Anyway, that’s what I remembered when I was sketching that fire hydrant, with the tramway humming past me. An honourable mention goes to this hydrant, which I did not sketch (I was on my way to a morning urban sketchers meet-up). I loved the way it was hiding in an alley, half in shadow, with the silhouette of a very Alsace-looking shop-sign just behind it. Strasbourg-hydrant-noir, if you like, but you know, in the daytime.